Chesapeake Energy Corporation cuts 15% of its workforce in another sign that the energy industry’s slide is continuing. Image source: Flickr user Jeff Foster. The energy market downturn continues to wreak havoc on the finances of oil and gas companies. Struggling under weaker prices, a mountain of debt, and no sure sign of a recovery on the horizon, energy giants are turning to layoffs in hopes of easing the sting from falling commodity prices. Chesapeake Energy (NYSE:CHK) is the latest detailing deep cuts. Chesapeake Energy is reducing its workforce by 15%, or 740 employees. The bulk of the cuts are coming from the company's headquarters in Oklahoma City, where it's laying off 560 people. That's a deep cut; it's nearly 20% of the company's 2,500 employees in Oklahoma City. It was an "extremely difficult decision" for the company according to CEO Doug Lawler in a letter to employees, but it's one the company needed to make in order to survive what looks to be a long downturn in commodity prices. The cuts are one of several actions taken by the company as it seeks to reduce its costs in an effort to realign its business for much lower prices. Chesapeake Energy's employees may be the latest victims of the downturn, but they are not alone. Top U.S. oil giant ConocoPhillips (NYSE:COP) recently let go of 10% of its employees in a move to align its business to the current environment. Those cuts amounted to about 1,800 jobs worldwide, including 500 of ConocoPhillips' 3,750 employees at its Houston headquarters. Meanwhile, job cuts at oil-field service companies such as Baker Hughes (NYSE:BHI) have been even deeper. As of this July, Baker Hughes has laid off 13,000 employees in an effort to right size its business to match the significant reduction in drilling activity in the U.S. and abroad. Baker Hughes has now reduced its workforce by 21% since its payroll peaked at 62,000 last year before oil prices collapsed. It is estimated that the steep drop in crude oil prices has now cost the U.S. more than 86,000 jobs directly related to oil and gas drilling. However, the actual job losses stemming from the oil market meltdown is likely exponentially higher due to indirect and induced job losses in now former boomtowns in Texas, North Dakota, and Oklahoma. Many more job losses are likely to follow unless crude prices make a dramatic turnaround. Unfortunately, such a turnaround is growing more unlikely due in part to OPEC's decision to push oil prices lower in an attempt to stifle the U.S. oil industry. It feared that U.S. oil production was growing too fast and potentially disrupting its stranglehold on the oil market. So, it not only elected not to reduce its output when demand growth slowed more than expected, but has actually been pumping out more oil than its quotas. This is in response to the remarkable turnaround in U.S. oil production over the past few years thanks to shale drilling. 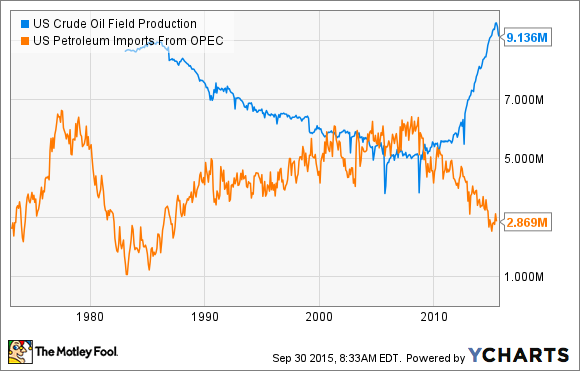 As that chart notes, as U.S. oil production has risen, OPEC's imports to the U.S. have fallen. That has left it searching for new markets for its oil, namely in Asia, which are the same markets U.S. oil companies would love to reach by having the oil export ban lifted. However, before we blame OPEC for the job losses in the U.S. there's one other factor that's a real driving force behind a lot of the industry's trouble. Oil companies took on an enormous amount of debt to fuel the oil boom, which in a sense stole growth from future years. As that chart shows, oil companies used more cash than they produced in order to fund new wells, with debt being one of the main bridges used to cross the gap. That debt-induced growth fueled a hiring boom in the industry. However, now not only is cash from operations falling as a result of lower prices, but so is the ability to borrow in order to bridge the gap as oil companies are at -- or over, in a growing number of cases -- their borrowing limit. That's leaving producers no choice but to reduce staff as not only is the work no longer there, but the interest payments on the debt are mounting. The energy industry is in a real rough patch as the boom created by high oil prices and debt is over. That's forcing companies like Chesapeake Energy, which borrowed billions to fund growth, to reduce staff in order to cope with the tighter operating conditions. It's one of many energy companies that now has to readjust to a new normal.